The School of Nursing and Health Sciences at the University of Dundee runs a range of undergraduate and postgraduate nursing programmes. 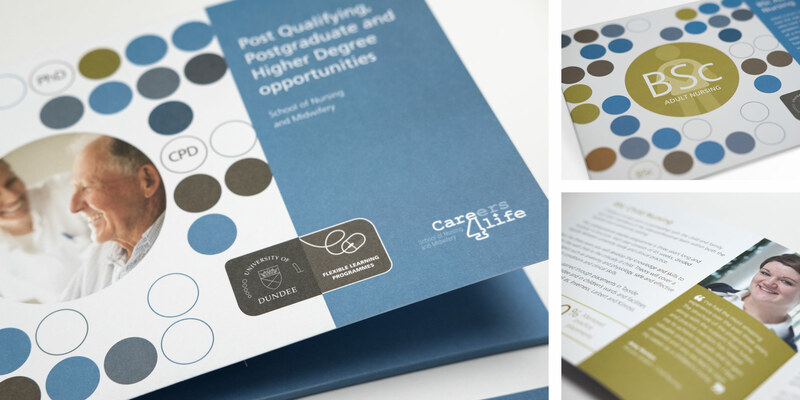 We were commissioned to produce coordinated recruitment literature for use at recruitment fairs and for general promotion of programmes at the School. The design focused on distilling key information about each programme into a few pages. Each A5 leaflet could be handed out individually or packaged with other course information in a matching folder. The aim of the literature was to capture the interest of the reader and to drive them to the University website recruitment pages.